The LMP1 team includes over 200 people. It’s the mixture that does the trick: endurance racing experience, company expertise and fresh Formula-1 know-how. He lives and breathes Porsche. When the Swiss citizen by choice is not driving on the Porsche factory team, he is off on a private mission. Such as at Pikes Peak, in Macau or in the French Rally Championship, where he won four stages in 2013, driving a 911 GT3 RS. His resume includes seven overall victories in 24-hour races – the Le Mans win in an Audi along with Timo Bernhard and Mike Rockenfeller in 2010, four times at the North Loop of the Nürburgring and twice at Spa in Porsche cars. The Mediterranean is not far from his birthplace of Alès, and boats are another of his long cherished passions. Dumas’ most recent passion, however, is named Gabin, who was born in late 2013. As a 20-year-old, the native of Stuttgart won the Porsche Junior Driver Selection. Ever since, he has celebrated Porsche victories across the globe, including five overall victories at 24-hour races: four times at the Nürburgring and once in Spa. At Le Mans, he won in the GT class with Porsche – now he wants to compete in the top category there as well. The young father of two has not only applied his talents to the development of race cars; the services of the vehicle technology engineer were also highly appreciated in the development of the 918 Spyder. In autumn 2013, he set the course record on the North Loop of the Nürburgring with the super sports car. This Formula-1 star – with 215 Grand Prix races, 13 pole positions and nine victories – has taken up the challenge of sports car racing. Born in Queanbeyan (New South Wales), he moved to England in 1996. Formula Ford, Formula 3, sports cars, Formula 3000, Formula 1. The outdoor sports enthusiast still has a score to settle at Le Mans. In 1999, he rolled over twice in his AMG Mercedes CLR due to an aerodynamic problem. What Porsche means to him: “Super highly developed sports cars that can make do without overstatement – perfect in every mood and in every scenario.” He lives with Ann Neal (and their many dogs) in Aylesbury (UK). He knows how it is to win the most famous sports car race in the world. In 2010, he was part of the victorious Audi team at Le Mans together with Romain Dumas and Mike Rockenfeller. He wants to do that again. “To do this with Porsche would be awesome. It's impossible to describe my enthusiasm for the brand.” Bernhard, who began his Porsche career in 1999 as a junior, has attained seven overall victories in 24 hour races – five times on the Nürburgring and once each at Le Mans and Daytona. 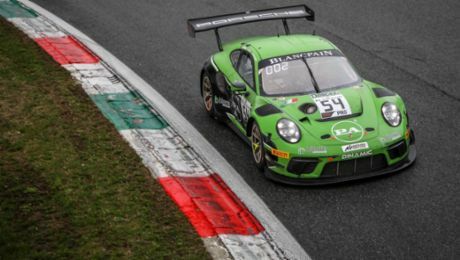 Endurance racing is not his only passion: In 2013, he won a stage of the German Rally Championship in his homeland of Saarland, driving a 911 GT3. This native of Styria was employed in the services of BMW for thirty years. He was in positions of responsibility in touring car victories at Le Mans 1999 and in Formula-1 successes. At the end of 2011, he switched to Porsche and began to build up the LMP1 project in Weissach. Building, personnel, vehicle – organising everything from scratch was an irresistible challenge. Two goals spur him on: first, to create sustainable top sports organizational structures for the company. Second, to score a 17th overall victory for Porsche at Le Mans as quickly as possible. Raising Iceland ponies is his hobby for unwinding, a passion that he shares with his wife and daughter. At the end of 2011, he turned his back on the Formula-1 world championship team of Red Bull Racing to join Porsche. He was fascinated by the opportunity to be part of the brand’s continuing great motorsport history. As technical director of the LMP1 team, the Bavarian was responsible for the development of the 919 Hybrid – a vehicle of high complexity with a lot of potential for genuine innovations. The engineer has a long résumé of experience in various high-class motorsport categories. His positions included “Head of F1 Development” for the English race car engine builder Cosworth and most recently “Head of Advanced Technologies” at Red Bull Racing. He is married and has two children. What is fascinating about motorsport to Seidl, an engineer, is the immediate feedback that it offers. Every modification undergoes a stress test in competition, and the test bench is public. This Bavarian can handle the pressure. It is the results that count. He is enthusiastic about the team spirit and the perfect staging of a race weekend – in both its technical and organisational aspects. At BMW, Seidl was responsible for testing and race events in Formula-1 racing. When the company returned to DTM racing, he was racing director and immediately attained the championship title. Mission completed. At Porsche, the father of two found a new challenge.